Have you ever taken part in a panel discussion? 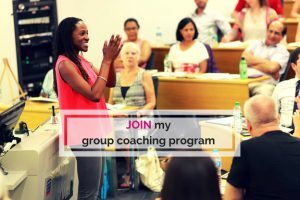 Maybe public speaking is the norm for you – you’re used to planning your speech carefully, practising your delivery and taking control of your speaking environment. Well, being on a panel is a whole different ball-game. In some ways it’s easier as you have less control and there’s less planning to do, but it’s also more difficult. Again, because you have less control! The moderator and your fellow panelists will also contribute to your experience – it’s not just down to you! Recently I had the opportunity to take part in a panel discussion at an event organised by Marie Claire UK at the Sofitel St James in Central London. Here’s what I learned, organised into a top 10 list, in no particular order. 1. Having a book helps, whether or not it’s self-published. My PR team contacted Marie Claire seeking a book review. The bad news was that we were too late to fit into the magazine’s schedule – they usually like books to be submitted 3 months before publication. The good news was that someone on the team decided I would be a good fit for their upcoming Future Shapers Event – so I was in! 2. Do whatever you can to participate. It turned out that on the day of the event I was scheduled to sing and DJ at a party in Lancashire, 5 hours north of London. Timing would be tight to both be on the panel and then rush up to the north of England straight after the discussion. I was in two minds as to whether I wanted the stress of worrying about getting to my second engagement on time. In the end I sucked it up and everything was fine. If in doubt, always participate. 3. Take the car and enjoy the luxuries. The event organisers offered to send a car to pick me up. Initially I thought I’d perhaps drive myself and go straight on to my event afterwards, but I managed to find a way to go in the limo and have my partner pick me up afterwards on the way to Lancashire. Sitting in the back of the car, instead of driving myself, helped me prepare my mindset for being on the panel. 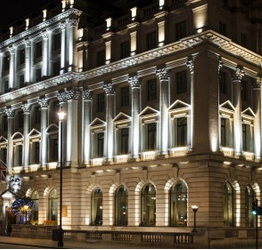 From the moment I would arrive at the super luxe 5* hotel right off Piccadilly, I’d be a VIP. I was going to be there for others so it was OK to take a few moments for myself, to relax in the back of the car and enjoy being chauffeured around. The panel moderator, Marie Claire features editor, contacted me beforehand and let me know about the questions we’d be asked. This gave me a chance to prep some answers in advance and led to me feeling more relaxed. When you’re on a panel, even if the host doesn’t contact you, take the initiative and reach out to them. Try to get a sense of what you’ll be asked. Even if the discussion goes off track, you’ll start out feeling more self-assured having done your homework. 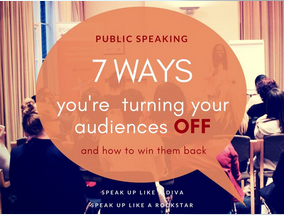 Download the free guide: 7 Ways you’re turning your audiences off, and how to win them back. 5. Take a wing man or woman along with you. I was lucky enough to have two friends accompany me to the event. It helped, seeing familiar faces. Also, my buddies were able to get some extra video footage of me in action. Many events will have their own camera team present and you may well be offered photos. However, you may not get much control over how these look and in some cases they may not bother to send you the footage at all. If in doubt, get your own, by hook or by crook, and ask your friends to assist. My wing women were also out there spreading the word about my business and one of them even managed to collect a business lead for me during the short time I was there at the event. I was asked to be at the event at 11am, ready for my panel discussion at 11.30 but I decided to catch the beginning of the event and arrive an hour earlier. This gives you time to get a feel for the vibe of the event, to catch the opening keynotes and speakers and to get a sense of the proceedings. I was able to have a relaxed chat with the panel moderator, catch up with my wing women and enjoy the ambience before it was time to go ‘on stage’. This allowed me to feel much more relaxed about what was to come. 7. Network with the other panelists. This is a key opportunity to make some business contacts, or even new friends. Sadly I couldn’t stay the whole day but I made sure to get the panelists’ contact details and reached out to them after the event. Also, make sure you big them up, and the organisers too, on social media with tweets and Instagram postings. 8. Be prepared to be interrupted. As an introvert I can be a bit shy about interrupting others, but remember that during a panel discussion it really can be a bit of a free-for-all. If the moderator does a good job then the discussion will stay on track, but once you start answering your questions, be prepared for others to interject with their own points of view. This is substantially different from public speaking. 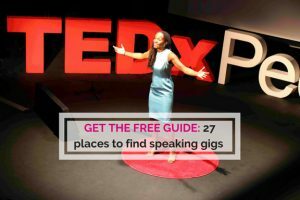 For naturally quiet or more retiring types, public speaking and performing can be a great opportunity for uninterrupted stage time, which can be a welcome relief from the hurly burly of every day conversation where you may not get more than a couple of words in before the conversation is whipped away from you. Panel discussions are different! Stay on your toes and feel free to chip in whenever you feel you have something of value to add. On the other hand, don’t feel bad if you speak less than others. Your opinion is valued otherwise you wouldn’t be on the panel. Speak when you can and stay engaged while others have their say, with smiles, nods and the like. 9. Be prepared to give to the audience. I took my book along and showed it to the audience. I had also gone to the effort of making my Kindle book How to be a DIVA at Public Speaking free on Amazon during the weekend of the event. That way I was able to tell the audience that I had a special gift of my book that would be available to them for the next 36 hours at no cost. I’m not sure if any of the attendees actually downloaded it but it felt good to have been able to offer it to them! If you don’t want to give away a free book, you could direct people to a freebie on your website. I might have done this but wasn’t sure how easy it would have been to direct people to a URL during a panel discussion! Even though I had to rush away to get to my gig, I made sure to hang around in the room for a few more minutes after the discussion ended. I figured there might be some ladies that wanted some advice or needed encouragement and didn’t want to ask questions in front of the entire group during the Q&A. 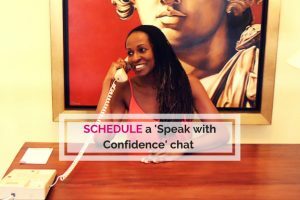 I was able to chat to an aspiring author, to encourage an artist who was working on a Kickstarter campaign to raise funds for her work and to speak to another couple of ladies that wanted some public speaking advice. These interactions were arguably as important as sitting on the panel itself. When people see you on stage you’re viewed as having influence and authority. Give back by cheering on your interested audience members and encouraging them to keep in touch. 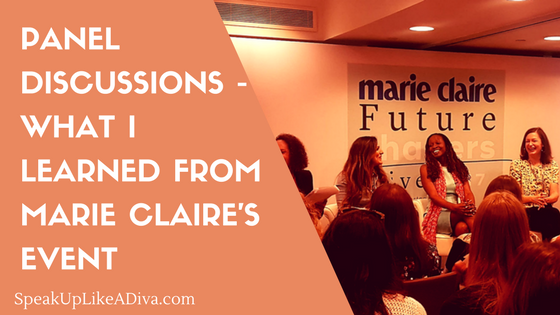 So, those are my tips and learnings from being on the Marie Claire panel. I loved the experience and hope to do more panel work. The most important lesson was to keep creating and to keep reaching out. If my team hadn’t made contact with Marie Claire in the first place, it would have been someone else sitting on that panel instead of me! So, research the events you are interested in, if it’s too late to ask to be a panelist this year, make contact with the organisers, attend the event, and then see if you can get involved at the next one. Share your expertise and make a strong case for why you should be involved.